The street remains, but the view has changed dramatically at 6th and Peachtree through the decades. 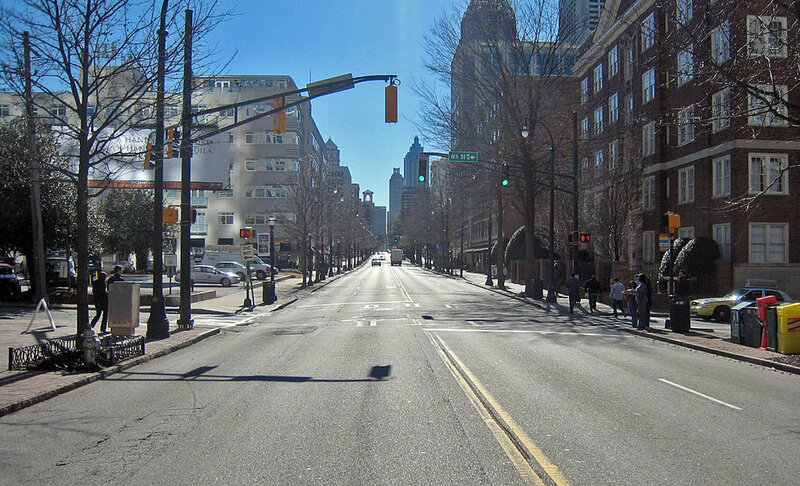 The Peachtree Street corridor in Midtown once hosted streetcars, not to mention on-street parking. More people discovered more transportation options in Midtown’s network in 2017. During evening rush hour on March 30, 2017, a major fire broke out beneath an elevated section of I-85—just north of Midtown Atlanta—causing a 350-foot section of the highway to collapse. The incident impacted travel on parts of the interstate into and out of the City. To minimize impact on Midtown commuters, Midtown Transportation responded rapidly to provide information and services to our member companies. In less than 24 hours, staff created and launched a custom webpage to direct people to resources about taking transit, carpooling, teleworking and more. The outcome? A 23% increase in transit pass sales year to year, with approximately 15% of that growth occurring after the closure. Meet the commuters featured in our inaugural Go Car-Lite challenge, held in the fall of 2017 to encourage residents and workers to try new travel options and use Midtown’s transportation network to the fullest. Are you ready to Go Car-Lite in 2018?